Since the late-1800’s, the use of reinforced concrete has been the most widely used construction practice globally because reinforcement helps concrete in tension. However, one concern of using this practice is the durability and longevity of the concrete due to the corrosion potential of the reinforcement. Corrosion of reinforcing steel is the number one cause of failure in reinforced concrete structures. Corrosion as defined by American Concrete Institute (ACI) is the deterioration of a material, usually a metal, that results from a chemical reaction with its environment.1 The corrosion of reinforcing steel is an electrochemical reaction consisting of the flow of electrons and ions that produces a deterioration of the steel and its properties. One significant way to reduce the corrosion potential is to completely encapsulate reinforcing steel in concrete with a high pH value, as the high alkaline environment acts as a protective oxide film. If no other outside forces are applied to the reinforced concrete, the steel should not rust. Unfortunately, almost all reinforced concrete is exposed to environmental conditions that shorten its lifespan, increasing the potential for the corrosion. 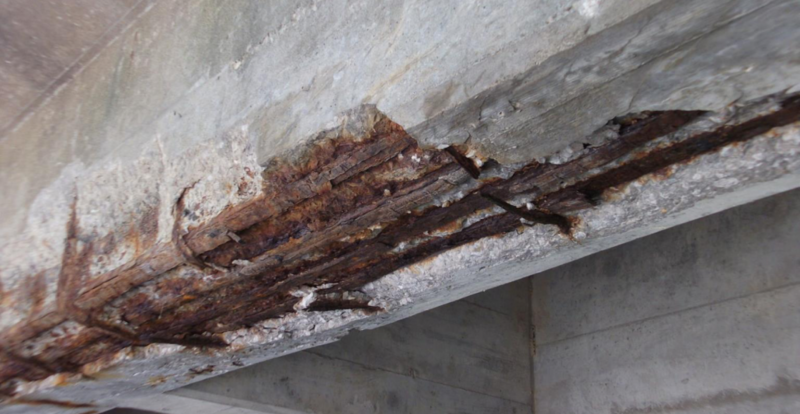 The corrosion potential of reinforcing steel is influenced by several factors: moisture intrusion, lowered pH values over time, quality of the concrete and construction materials, proper concrete coverage of reinforcing steel, initial curing conditions and the formation of cracks in the concrete. These factors can speed up chloride movement into the concrete, disrupting the protective oxide film around the reinforcing steel and leading to rusting. This corrosion can lead to spalling and delamination of the concrete structure and reduced tensile capacity. Spray-Lock Concrete Protection (SCP) provides treatments that penetrate the pores and bleed-water capillaries in concrete. SCP products bring the pH of older concrete to a higher value and stabilize the pH of new concrete to maintain a high value, lowering the potential of reinforcing steel corrosion. Additionally, the colloidal silica in SCP Technology reacts with the available alkalis in the capillary and pore space to form calcium silicate hydrate (C-S-H). By filling these spaces, SCP products waterproof concrete within the interaction zone. If the concrete structure does not have any structural cracks, SCP products also waterproof the structure in the application area. With SCP Treatments stabilizing pH levels and preventing moisture migration from carrying chlorides within the concrete matrix, the corrosion potential is greatly reduced.